Amanda at Crazy Mom Quilts makes these great oversize floor pillows for her kids and I have been wanting to make one ever since I saw her first one. Unfortunately I don't have any kids, but I know people who do! To make the pillow I first made my own pillow casing from a sheet and stuffed it with about 5lbs of Poly Fil. 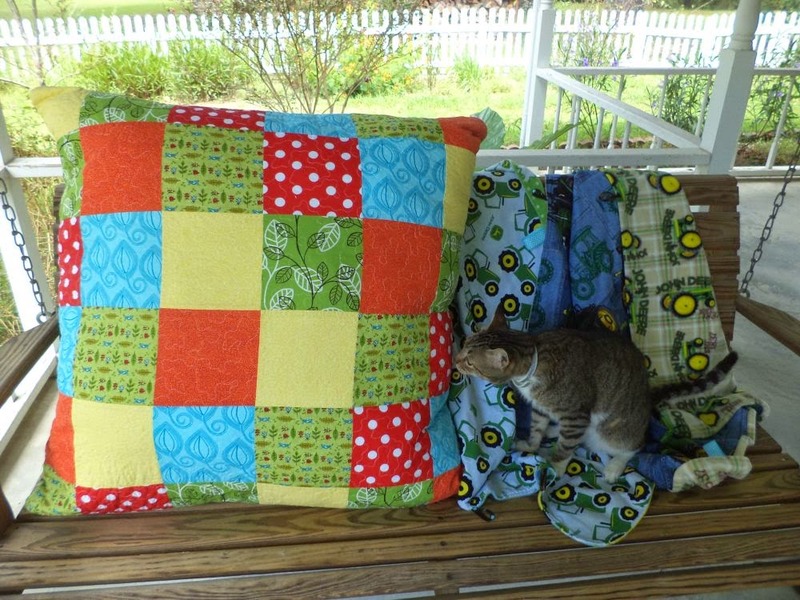 Then I made the pieced top and solid back for the pillow and simply stippled them onto batting. 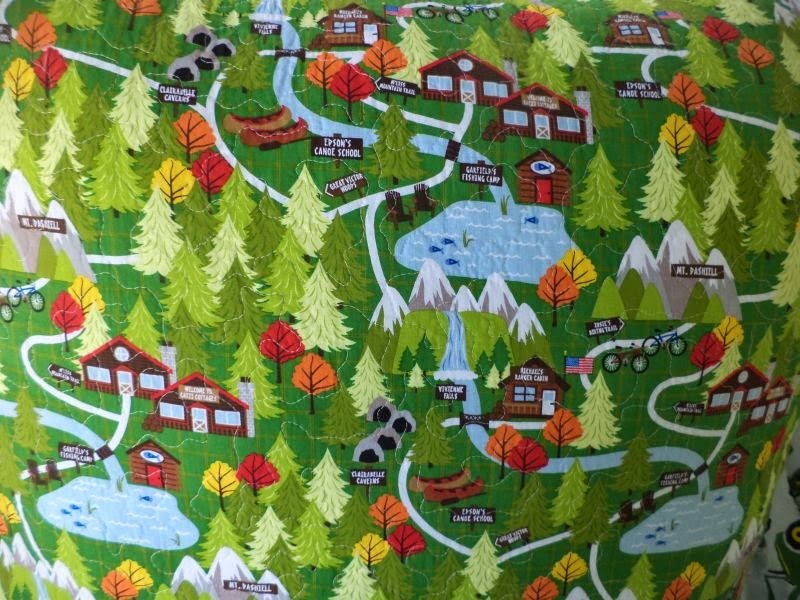 Amanda says that it's hard to really understand how big these pillows are until you see one in person, and that is definitely true. It's huge! Fortunately Wilson hopped into the picture to give some scale. I made a hidden zipper, which was a first for me. It's not exactly invisible but it is low visibility, and more importantly I think it's recessed enough not to scratch the floor when little boys jump off the couch onto this pillow and slide across the room. 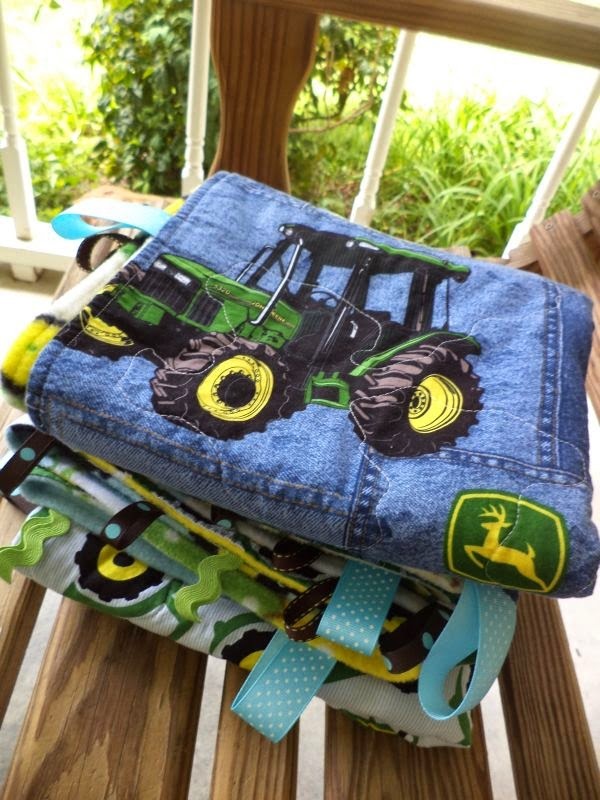 After I made the pillow but before I delivered it I was wandering around Hancocks and saw they had their John Deere fabrics on sale. 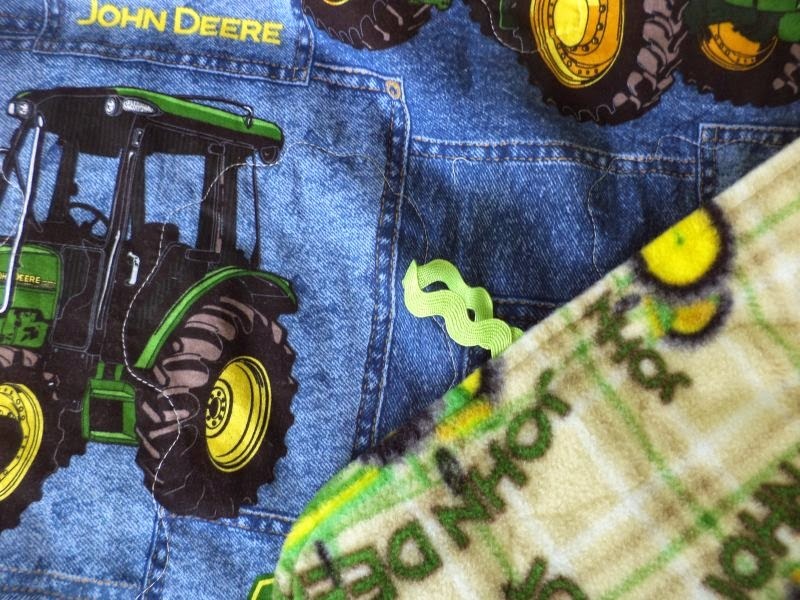 One of these little boys is OBSESSED with John Deere. So, of course, I had to make some quick nap-time blankies. For each blanket I got 1yd of fleece and 1 yd of print. I sewed them together pillowcase style, sandwiching some bits of ribbon and ric rac in the seam. After turning them right side to and hand sewing the opening closed I just sewed a round about 1/4" from the edge to hold everything in place. I did a really really large stipple on both blankets to hold the layers together. Not strictly necessary since there is no batting, but I think it looks nice. The combination of fleece on one side and cotton print on the other feels very soft and cuddly but nice and light. Even though I knew that these would end up around 44"x36", as that is 1yd x WOF, and I have made baby quilts in that size before, I was still pleasantly surprised by how large they seemed when I got them all done. They will be able to grow with the boys for several years! And that's what I've been working on this week. What about you? Linking to WIP Wednesday at Freshly Pieced and Whoop Whoop Fridays at Confessions of a Fabric Addict. Oh how fun! 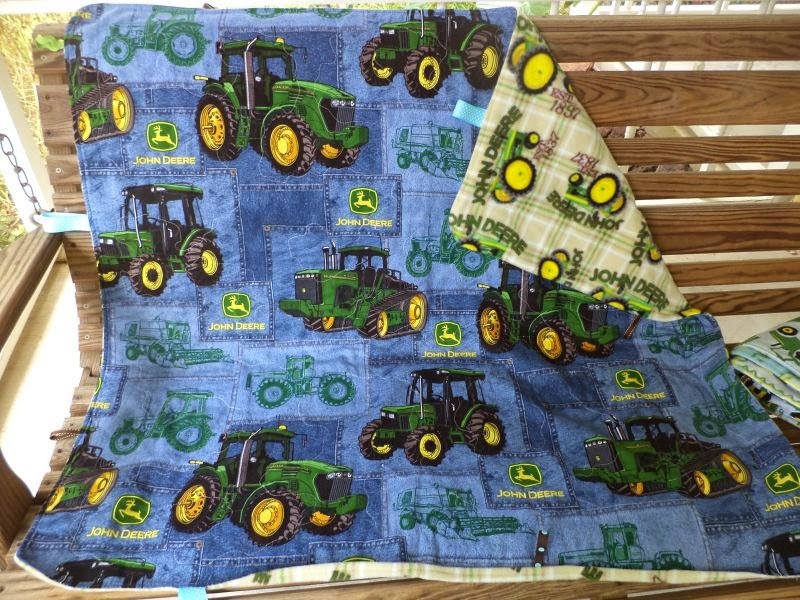 The little boys they are intended for are going to love both the pillow and the nap time blankies. Wow! That is a big pillow! I really like it! 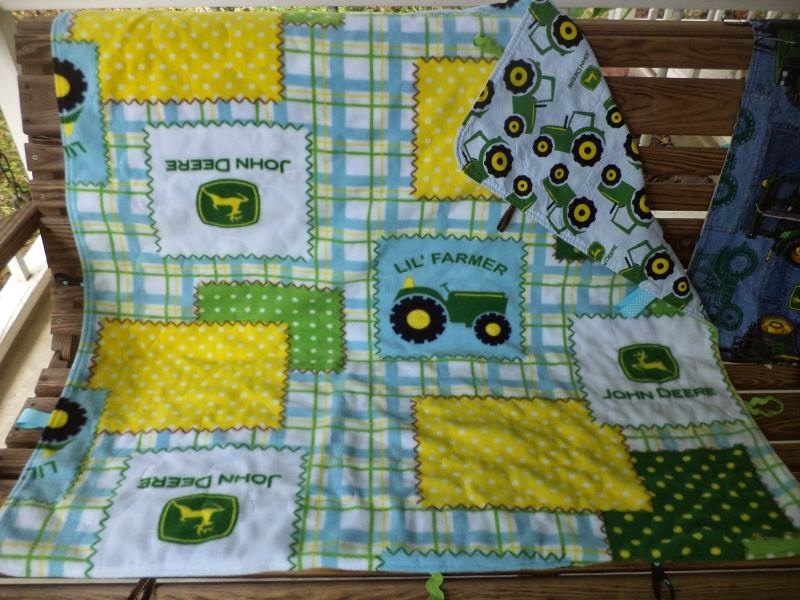 That John Deere quilt is darling!! Great job all around. What lucky boys.